“La via del Guerriero” is the debut album of this uncompromised Italian combo coming from the same base of ATMF’s operations: Trieste. 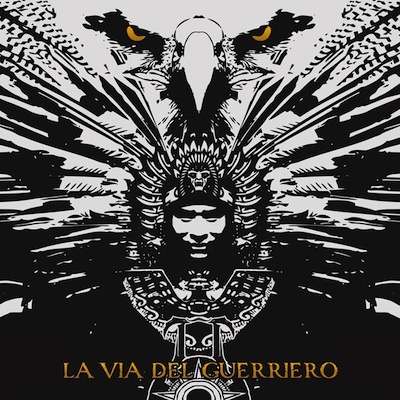 “La Via del Guerriero” is based on the writing of Carlos Castaneda, influenced by the medicine man Don Juan Matus, who introduced him to the way of the warrior, bringer of the primordial light, differently from the schizophrenic modern man. His heart started to be opened to a vision of eternity and absolute against the common sense, to perceive light and darkness as an unity, transcending both. During ego annihilation process the veil of maya was gradually broken to reach an atavist dimension dominated by the spiritual side. The Tal’Set debut album is a musical manifestation of this experience. Same goes for the music, where an aggressive form of black metal, sometimes triumphally manifested, other time more reflexive and contemplative, including ethnic mesoamerican Toltech vibes. The inner meaning of this release is about the universal perspective of those concepts, where the meso-american scenario is the inspiration but not the limitation. Musically speaking point of references may be Deathspell Omega, Spite Extreme Wing and ’70 rock music, as recently done byThe Devil’s Blood or Enslaved for example. A personal and unique merging of 70’ rock music, fusion and experimental part with the Black metal strength. For fans of Spite Extreme Wing, Deathspell Omega, 70’ rock, The Devil’s Blood and Enslaved.